“Congress Will Deliver” – with this tagline, the party released its manifesto today for the national election starting April 11. 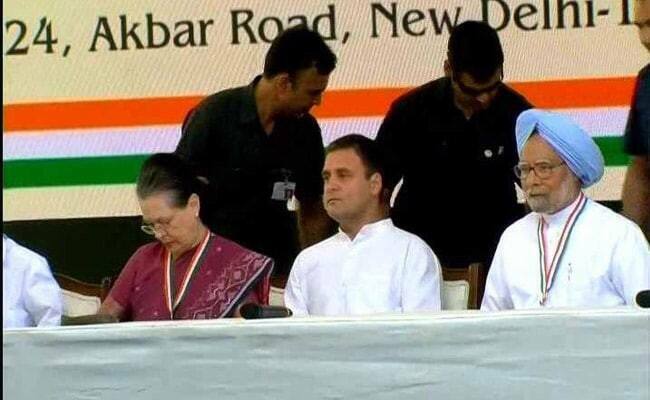 Congress chief Rahul Gandhi, launched his party’s poll promises, flanked by his mother Sonia Gandhi and former prime minister Manmohan Singh and P Chidambaram. “When we started a year ago, I made it clear that nothing in this can be a lie, because we live in a time where we hear a large number of lies every day,” Rahul Gandhi said. The party has promised 22 lakh government jobs by next March and 100 more days of assured jobs under MNREGA. It will also have separate budge for farmers, on the lines of the Railway Budget, said the Congress president. Farmers who default on loans would not be sent to jail as it will not be a criminal but civil offence, he added. The NYAY scheme, which assures Rs. 72,000 per year for India’s poorest is also one of the five main themes of the manifesto. “And this will help remonetize what Mr Modi had demonetized,” said Mr Gandhi. He also pledged to turn “Gabbar Singh Tax”, his name for Goods and Services Tax, “back into GST”, and simplify it. “The narrative is NYAY. It is if (Prime Minister Narendra) Modi can give Rs. 30,000 crore to Anil Ambani, then Congress can give Rs. 72,000 to the poorest. Modi has got a shock effect of this. He’s hiding behind excuses. He can’t hide behind the reality, which is joblessness,” said Rahul Gandhi.